Winter has been especially cold, harsh and long in the Central US where I live. The meteorologists can’t seem to provide forecasts that I like so I decided instead to focus on the Summer forecast of Salesforce new features. I took at look at the Salesforce Lightning roadmap that Salesforce provides and reduced the pages and pages of features down to just the features planned for Summer 2019. While there are several Reports and Knowledge enhancements on the Summer 19 Roadmap. I think the hottest Summer 19 feature will be the Related List Preview showing up to 10 columns and the ability to Filter Related Lists. Just think how useful and efficient that will be to end users to see key information at a glance AND interact with it without having to drill-down to another page. One of my favorite features of Summer 19 will definitely help automate and save your end-user time and mistakes, but sadly will probably be underutilized. I am referring to Macros with Conditional Steps. If you have not already I strongly encourage you to build Macros for your Salesforce end users. With macros, repetitive tasks–such as sending an email and updating a case status–can be reduced from multiple clicks to one. Macros work great today already and the addition of conditional steps will make it an even more powerful tool. I can’t wait for these and the other hot new Summer 19 features to be released to Sandboxes about mid-May and in Production around mid-June. Hopefully summer will be here before we know it. If you’re a Salesforce Admin chances are you have created tons of list views for Accounts, Contacts and other objects for your users to use. I recommend you take some time to create list views for YOU to use. You’ll find that they can help you quickly access information–saving you valuable time and frustration. In fact, there are several areas in the Setup area where you can add list views. You can create custom list views for Permission Sets, Profiles, Users, Public Groups and Domains just to name a few. In this post, I’m continuing my series on User Management Tips from one of my Dreamforce 14 presentations. 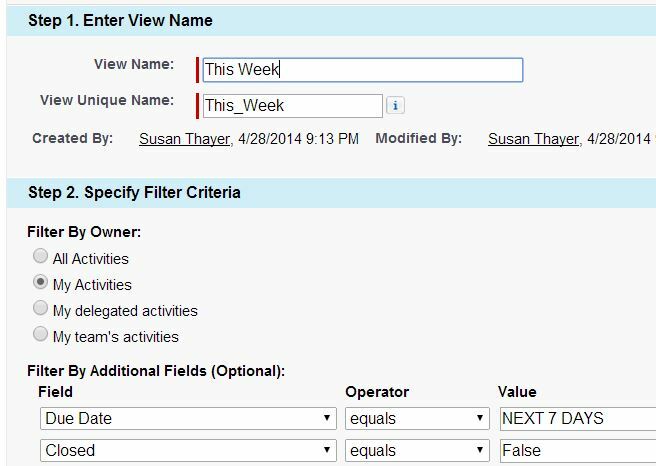 I’m sharing ideas on how you can use Salesforce List Views on the User object to make you a more efficient admin. Users in each division or department. In my last post I talked about adding custom fields to your User object. You can use those in your list view as well. Say for example, you created a custom field to track users for an add-on webinar product, you can create a list view of “Webinar Users”. This is very helpful when you need to report on users or send a mass communication out to the users of that product. Other common list views on custom fields include users by cost center or mobile device users. One of the most common user management complaints that I hear is that you cannot delete a User from Salesforce. Instead you can only make them active or inactive. Not being able to delete a User is actually a good thing as it helps maintain any historical information about that user, including completed tasks and prior record ownership. But most of the time if a user is Inactive an Admin doesn’t want to see them in the list of users. That’s why for all of my User list views I filter out inactive users. All you have to do is set the “Active” field to equal “True”. Now, those inactive users never, ever show up on my views–they’re as good as dead to me. Because I occasionally do need to see inactive users and you probably do as well, I do recommend creating one list view called “Inactive Users” where the “Active” field equals “False”. As with all list views, you can opt to have user list views visible only to you, to all users or share with certain groups of users. Most of these list views you’ll want to share only with other Admins. As you can probably tell, I love list views! I find them much faster than reports for managing my daily admin workload as I can jump from one view to another instantly. I can customize the columns on the fly if need be and quickly drill-down and view and edit the records I need to work on. I also like that I can click on column headers to quickly sort and filter by values. The one big gotcha though is you cannot do inline edit on the user list view. Be sure to vote for this idea as it will be a huge time-saver for editing multiple users at once. Even without this, user list views should be in your user management arsenal. 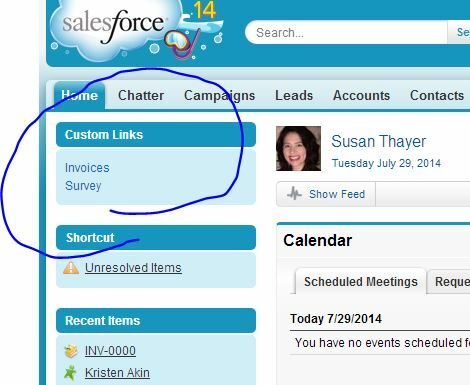 Most Salesforce orgs have a limit to the number of custom “Tabs” that they can have. Currently, the limit is 5 for Group, 10 for Professional and 25 for Enterprise. Throw in a few custom objects and websites and it is easy to hit the ceiling on Tabs. Fortunately there is an easy way to get to an objects Home page without using one of your precious few tabs. Instead of a tab at the top you can easily add quick links to the left side-bar of your Salesforce screen that takes the user to the desired page. The first thing to do is to get the secret Entity ID to your custom objects home page. This is easy to do. Just go to ANY record for your custom object. Look at the URL and take note of the first three characters after “Salesforce.com”. Two items of note, alpha characters are case-sensitive and zero (0) and O are really, really hard to tell apart. To reduce the likelihood of error I like to copy and paste. Enter a new Bookmark name to display and then the URL to link to. The URL only needs to contain the 3 digit Entity ID. You should remove the first part of the url that references the specific server (In this example I omitted https://na14.salesforce.com). This will allow your link to work even if you are moved to a new Salesforce server. I also like to add “/o” to my link so it takes the user to the “Recent Items” view for the object and it displays the object name at the top. It works without the “/0” but that takes the user to their last List View. Now I make sure my “Custom Links” are displaying on the home page layout by going to “Home Page Layout” edits. I check the box next to “Custom Links” to display and indicate the order the narrow components should be in. 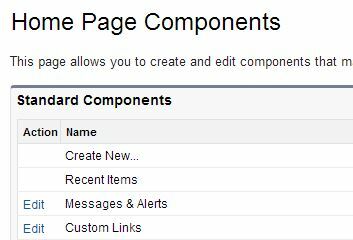 If you don’t want every user to see the link or you want different links for different groups there are ways to add Custom “Components” to different page layouts. For this example, we’re keeping it simple with just one group of “Custom Links”. Viola! Now my links to my custom objects display on the left-side navigation for every page I visit just like a tab would display across the top on every page. Clicking the link will take me directly to that objects home tab, as shown below, where I can now see my recent items and run any list view. 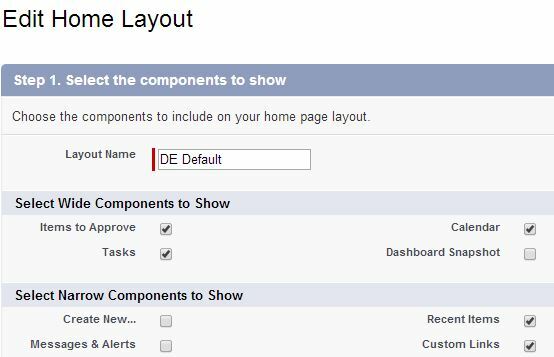 Note: If you don’t see the home page components on all pages then go to Setup>>Customize>>User Interface>>Settings and check “Show Custom Sidebar Components on All Pages”. You can do this same thing for links to standard objects, Visualforce pages, and other web pages. One very popular use for custom links is to link to the Activities tab. For your reference that is Entity ID number “/007”. Many users find it nice to have quick links to “My Open Activities” or “Today’s Activities”. That allows them to jump to activity list views without having to go to the Home Page. What will you link to? Whew! Just got back from an action-packed week at Dreamforce where I was able to test-drive many apps, learn new tricks and see the roadmap for Salesforce.com. Here are the top 5 new items covered at Dreamforce 13. 1. Salesforce 1. 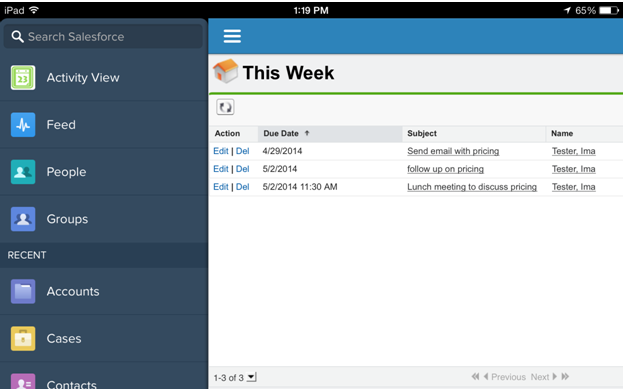 Salesforce 1 is the latest mobile app from Salesforce. I’ve been playing with it since it was released and really like it on my Android phone. It’s got Chatter, Cases, Opportunities and a consolidated “Today” calendar with a handy map/phone feature. For my iPad, I’m still partial to the browser solution but with a few enhancements I can see me using the app a lot more. 2. Salesforce A Like many Admins, I lugged my heavy laptop with me over 1500 miles to Dreamforce–just in case there was an emergency admin issue that my iPad could not handle. Next year it stays at home thanks to Salesforce A. SalesforceA is the new mobile app for Admins Only that makes it easy to see Users records to freeze users and reset passwords. It even has the release notes and quick access to the success community. 3. ExactTarget Marketing Cloud Okay, so those familiar with ExactTarget and Pardot really didn’t see anything too new but what was so exciting for marketing geeks like myself was the passion and emphasis that was placed on the Marketing Cloud at Dreamforce. The future of sales and marketing is digital and social. Seeing the case studies of the possibilities was amazing. 4. Mobile The mobile emphasis started with Salesforce 1 and Salesforce A but continued well beyond that. Salesforce was also busy this year developing an improved Dreamforce app that kept your session schedule, notes and chatter feed at the palm of your hand. The mobile hackathon featured a one million dollar prize–the largest ever for a hackaton. Some great new mobile apps were developed that hopefully will be on the market soon. Plus many of the vendors in the Cloud Expo demoed mobile solutions. Even the session check-ins featured magic scanners that they just waved in front of your badge. 5. Women Last but not least, Dreamforce was focused on the FemmeForce to encourage more women in IT and leadership roles. Need evidence of the lack of women? Just look at how the line for the men’s room is twice as long as the women’s. Keynote speakers featured Marrisa Mayer from Yahoo! and Sheryl Sandberg from Facebook. I for one was very moved by Sandberg’s talk about her book Lean In and encourage everyone to read it. It is very eye-opening. DF13 may have just ended but now the real work begins to test and implement all the new ideas and apps that I discovered. What fun!